In "Pechblende (Chapter 1)," Susanne Kriemann incorporates a range of objects that refer to the toxic history of uranium mining. 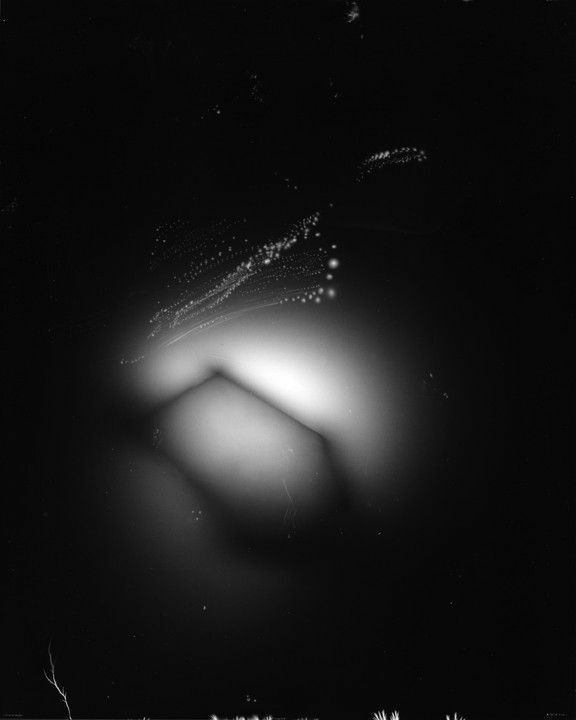 Illuminating these objects through a range of analogue photographic processes, Kriemann reflects on the artistic possibilities of making the invisible visible. Pechblende (Chapter 1) by Susanne Kriemann at the Project Space of the Ernst Schering Foundation presents a series of new works that are based on extensive research about the mineral pitchblende (uraninite) and which were created in close cooperation with scientific institutions, including the Berlin Museum of Natural History, the American Museum of Natural History, New York, and the Museum Uranbergbau, Bad Schlema. The radioactive mineral pitchblende was extensively mined in the Ore Mountains between 1946 and 1989, by Wismut AG/SDAG, which made the GDR the third largest uranium producer in the world and helped facilitate the nuclear armament of the USSR. The restoration of the landscape, which began after the fall of the Berlin Wall, is expected to be finished by 2045. The continuing radiation is increasingly forgotten. Susanne Kriemann’s installation Pechblende (Chapter 1) at the Project Space of the Ernst Schering Foundation reflects on the artistic possibilities of making the invisible visible. She employs both analog photographic methods and auto-radiography – a technique in which light-sensitive material is directly exposed to radioactive objects. Combining her auto-radiographs with archival material and museum objects, the exhibition focuses on the radiation that is capable of remaining invisible despite the light it emits. The first show on the project continues to be on view at the Prefix Institute of Contemporary Art, Toronto, until March 26, 2016. Pechblende (Prologue) shows a large number of the auto-radiographs that were recently made by Susanne Kriemann in close cooperation with scientists at the American Museum of Natural History in New York, the Berlin Museum of Natural History, the National Archives in Washington, D.C, and the Museum Uranbergbau in Bad Schlema, Germany. In parallel with the exhibitions, a virtual library is being created at www.pechblende.org, which makes available to the public a steadily growing collection of textual and visual material. An artist’s book, published by Spector Books, will be launched at the Ernst Schering Foundation on June 3, 2016, at 2 p.m.
June 3, 2016, 2 p.m.
April 14, 2016, 12 noon – 5 p.m.
A project in cooperation with Image Knowledge Gestaltung, Cluster of Excellence at Humboldt-Universität zu Berlin. For further information and events, visit www.scheringstiftung.de. A project in cooperation with Prefix Institute of Contemporary Art, Toronto and Image Knowledge Gestaltung, Cluster of Excellence at Humboldt-Universität zu Berlin, supported by Kunstfonds Bonn. We thank Lutz Seiler, the American Museum of Natural History, New York, the Museum für Naturkunde, Berlin, and the Museum Uranbergbau, Bad Schlema, for their kind support.